Complete Internet Repair is a free program for the Windows operating system that offers a range of tools that help you fix Internet connectivity issues. Have you ever experienced one or multiple of the following issues? The Internet is not working, again. Or, you are experiencing connection issues, slow downloads or uploads, connection drops, streaming issues, or high ping. What's the cause? You have no idea but know that you need it fixed asap. Instead of having to go through a lengthy troubleshooting session you could instead try to fix the Internet connectivity issue with Complete Internet Repair. 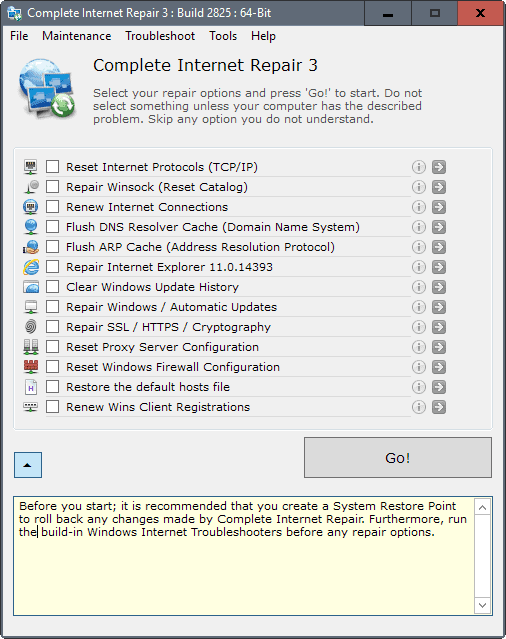 The free portable program offers tools to reset, restore, clear or repair a variety of Internet related settings and issues on a Windows computer system. Please note that it is not recommended to run all of the tools if you notice issues that are Internet related. The author suggests to only select those repair options that relate to the issue you are experiencing. While that makes sense, it is sometimes not that easy to determine what is causing connectivity issues. Before you make any change, it is highly recommended to create a system restore point as it allows you to restore it in case the fixing makes things worse and not better. You can do that from within Complete Internet Repair by clicking on Maintenance > System Restore. All you need to do is check the box of one or multiple of the repair options that the application offers. There is an information icon at the end of each line which you can click on to display a short description of what a particular repair, restore, reset, renew, clear or flush operation does. This option rewrites important registry keys that are used by the Internet Protocol (TCP/IP) stack. This has the same result as removing and reinstalling the protocol. While you don't get a complete technical analysis of each repair option, the description helps you understand better what a particular option does in the background. When can this program be helpful to Windows users experiencing Internet issues? The developer lists a few problems that it may resolve. Internet and network issues caused by the removal of malicious software, viruses and other undesirable software. Loss of network connections or Internet connectivity after installation or removal of software programs. When websites cannot be opened at all. When you receive popups related to Internet or network issues. When Registry settings are corrupt or improperly configured that affected network or Internet connectivity. When DNS look-ups fail or take too long. DHCP error messages or if the network adapter's IP address cannot be renewed. If you cannot connect to secure websites. If your web browser of choice crashes or stops working. If the net connection is limited. Complete Internet Repair is easy to use. Just select the items that you want to repair and click the go button afterwards. The status of the repair is displayed in a log in the program window. Some repairs may require a restart of the computer to complete. 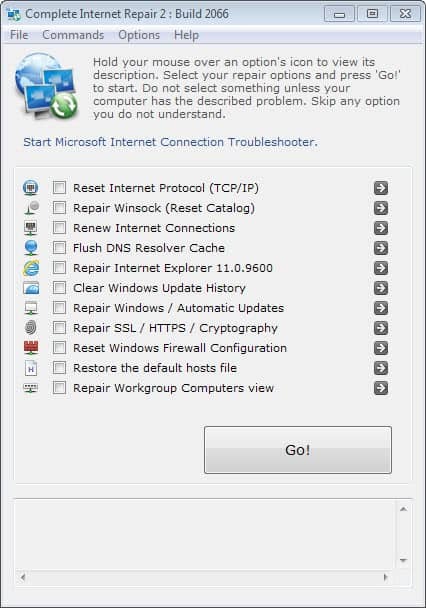 Before you do that though, you may want to run Microsoft's own Internet Connection Troubleshooter. It is linked from within the program which means it is easy to run right before you start selecting reset and repair options in the application itself. There you find other options, showing the IP configuration (which runs IP config), Winsock LSPs, all ARP entries, NetBIOS statistics. and links to an Internet speed test and a program to grab router passwords. Complete Internet Repair is a handy program for users who are experiencing Internet connectivity issues. The program can be used to repair several common Internet related problems. The portable program is available for download on Rizone, the website of the developer. The program can help you if you notice software or operating system related connectivity issues. It cannot fix hardware related issues such as improperly configured routers or modems. The executable scores 4 at Virus Total. I wonder if all 40+ anti-virus firms called by VirusTotal are truly valuable, as we might admit some companies are like puritans: they see sin everywhere. The worst in this is that false-positives, when on the account of lack of quality analysis, depreciates anti-virus tools as a whole. Detected as some generic false positive in Comodo as well. Also, this looks like it’ll be handy now and then, thanks for the heads up. Martin, thanks for the review anyway. Thanks Brett, Rizone is notorious for changing the path to the applications. I update the review today.